Onboard the yachts we are a multicultural mixture from all walks of life so our likes and dislikes are extremely varied where food is concerned. Most of the larger yachts have refrigerators in the crew mess where the Chef or Head Steward can place foods together with drinks ready for the crew to enjoy. I like to provide whole-food, plant-based snacks onboard. Lately, I have observed some subtle shifts towards healthier choices such as an increasing demand for raw nuts or dried fruit, for example, and the fruit bowl has become more popular! Prepared foods are convenient and make reaching for healthier options more effortless. Prepared dips and spreads as well as pre-chopped fruits and vegetables in large containers keep well in the refrigerator. As an added bonus, any prepared foods that are leftover can easily be recycled. Fruits and vegetables can be grated into the raw granola I make for the crew, or incorporated into a smoothie or baked good rather than going to waste. How often and how much we eat is important. We are offered great food onboard the yachts and really a snack is a luxury that we can have on the go, but it is definitely something to monitor. It can be easy to open the fridge or locker and grab something any time you are in the crew mess. Ensuring you take the time to have proper meals will curb cravings and reduce the need for snacks. An easy rule of thumb is to have a small snack between breakfast and lunch and another between lunch and dinner. Thirst can easily be mistaken for hunger. When you feel hungry, I recommend drinking a glass of water first. Water can fill us up without the added calories or sugar that we do not really need. Along with healthy eating habits, proper hydration is also essential for our bodies to function properly, especially given the warm climate here in Mallorca. Hummus spreads, tahini dips, fresh guacamole, salsas and pestos make delicious and nourishing pairings with fresh vegetables and whole grain crackers. Almond butter spread on apple or pear slices is also a great option. Homemade baked goods, such as muffins and cookies made with wholesome ingredients, are an opportunity to pack lots of nutrition into a satisfying snack. Homemade granola with chia seed puddings or overnight oat parfaits can be kept on hand in the fridge in small, individual glasses. A handful of raw nuts and seeds mixed with raisins and other dried fruit or roasted chickpeas are easy to snack on. Bliss Balls, enjoyed in moderation, are a fabulous bullet of raw, nutritional goodness too and are easy to prepare. A popular and tasty snack item, I prepare Bliss Balls regularly and serve them from the galley fridge to regulate consumption. Providing healthy options that also satisfy different tastes and cravings is a fine balance. We are very fortunate to have a variety of fresh, seasonal produce available to us that are grown locally on Mallorca and in the surrounding regions. When shopping, I recommend reading all the ingredients labels. My main goal is to provide real food with real food ingredients. We need to be aware of where our food has come from and make informed choices. At the end of the day, we eat based on what is available to us so ensuring there are plenty of healthy, easy options on hand can only mean healthy choices are made when it comes time to reach for a snack. 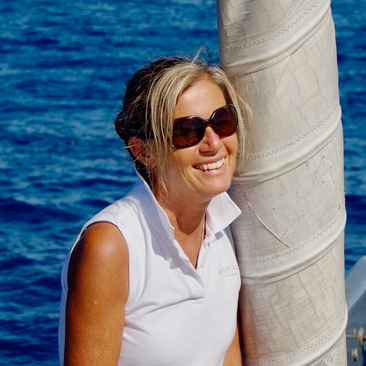 Working as a private yacht chef on racer cruiser sailing yachts for the past 25 plus years, Polly has seen a massive change in the industry and in the health of the crew on board! She has been a vegetarian chef since she started cooking and is now a plant-based chef. She feels very strongly about food and its immense importance in our lives, and how our lifestyles dictate our health. Trained in plant based cuisine, nutrition and sports nutrition and she continues to study in these fields. Her training and experiences is as a private chef and she now also works counselling and teaching people how to have healthier lifestyles to gain health and longevity. Sounds like my kinda food, yum!